With two sweaters approaching completion, I’ve been busily working away at a new design to take their place on the needles. The fall colors sweater is going to require spinning before it can be knit, so I turned back to the other yarn that has been waiting patiently in line. 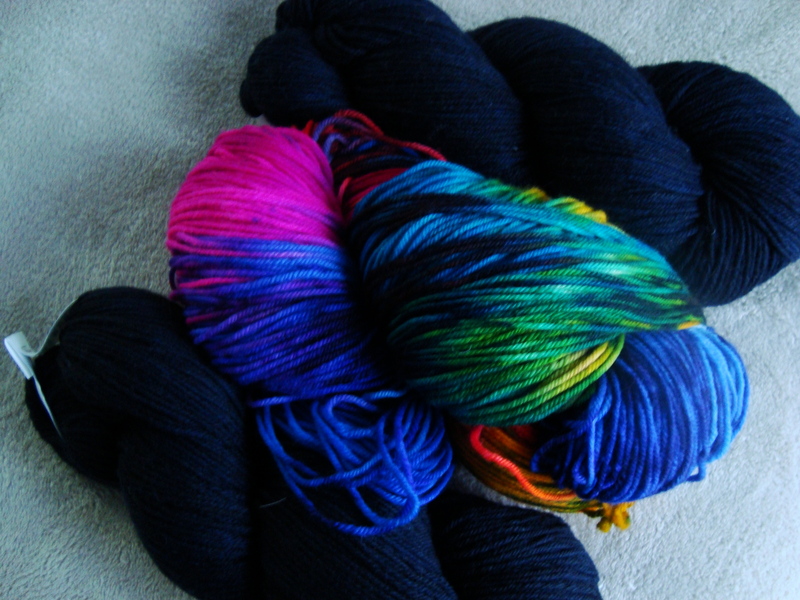 I bought this yarn because I loved the vibrancy of the colors, but I knew it was going to take some very careful designing to turn it into something that I would wear. 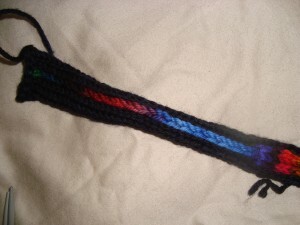 I wanted a pattern that would tone it down with a lot of black, but that would also highlight and flatter the colors. My first thought was stained glass, but for that I’d need isolated blocks of all the different colors. Since they’re dyed in 6-inch segments, that would either mean a lot of ends or figuring out how to do something useful with stripes. 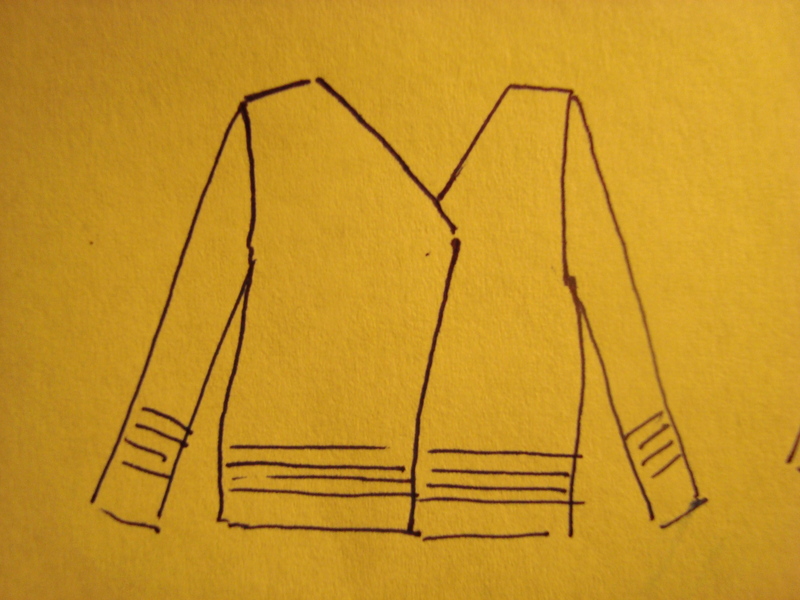 It would require an interesting construction, but I planned to knit the jacket from the outside in, so that the stripes at the edge could be knit in a single uninterrupted stripe of stockinette. 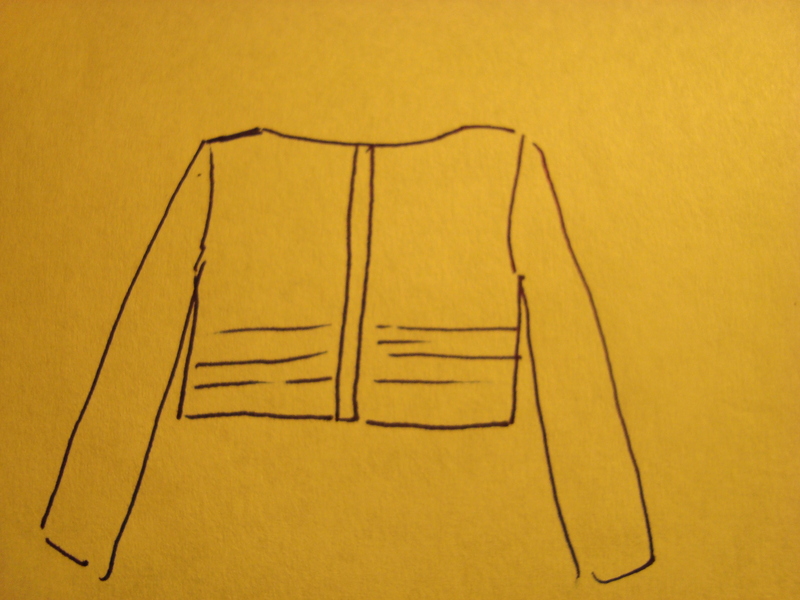 I worked out the geometry for the front, and even put in some waist shaping, but I just couldn’t make the back work. I knit up 5 or 6 scaled down model versions to try to get the shaping to work out so that the back would lie flat, but it was just not cooperating. 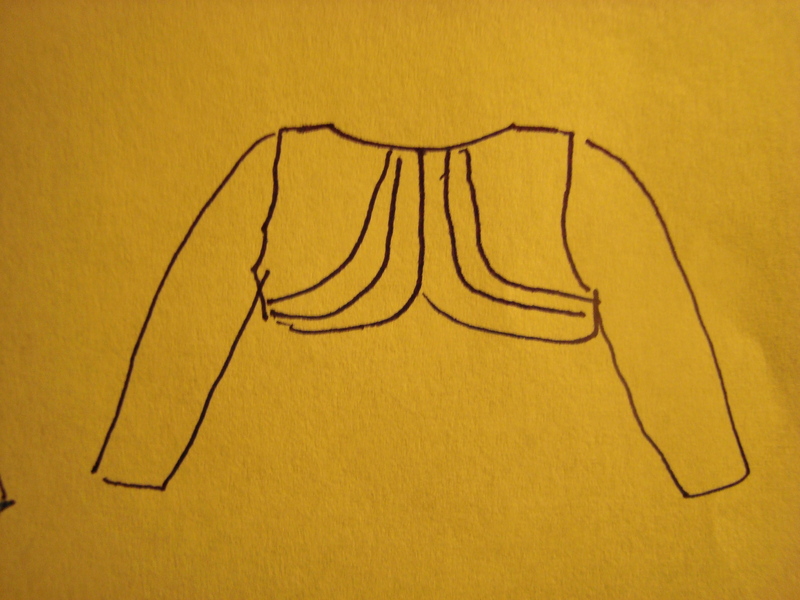 I’m all for process knitting, but I don’t think I’m willing to knit a whole sweater in a very odd shape just to decide that the back doesn’t work and rip it all out again. So, much as I like this design, it went to the scrap pile (at least for now…I leave open the option of it making a comeback). Next, I thought about keeping the semi-angled front opening, but fitting it to a more standard construction. 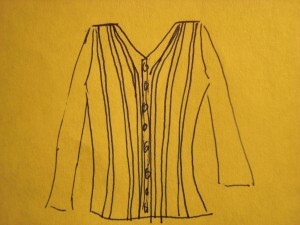 I like the garment itself, but the stripes become kind of a design detail rather than the focal point of the garment. 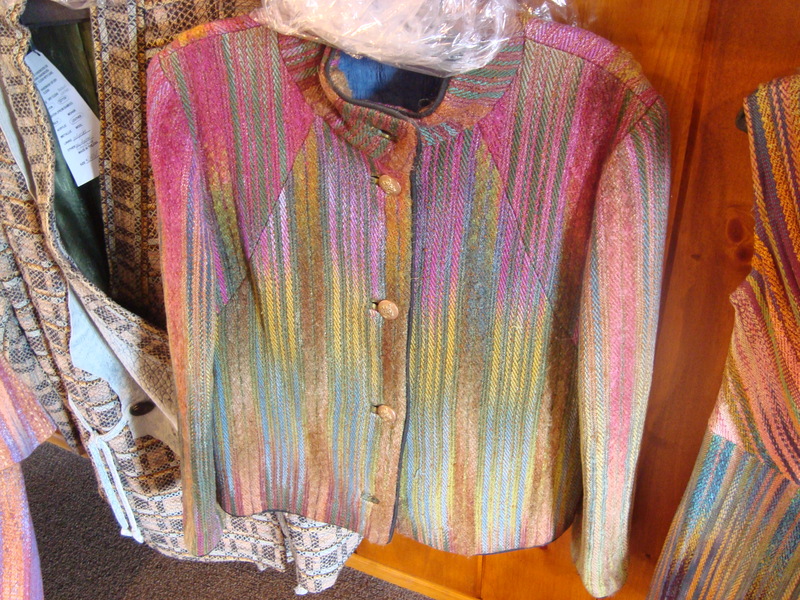 And I wanted that accent yarn front and center in the design. 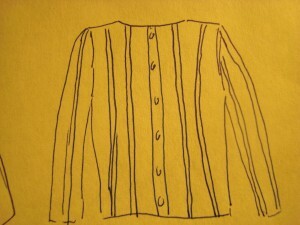 Or a raglan, for sharper edges in the color stripes. I liked both of these options, but wasn’t sure they were the best we could do, so I kept sketching. 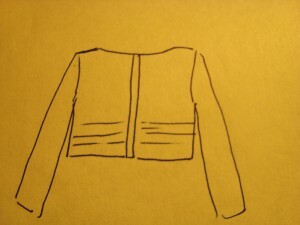 Bolero-type jackets do appeal to me, though I have yet to really wear one. Still, I like to play around with them in the sketching stage, in the hope that I will someday find one that I absolutely must knit. 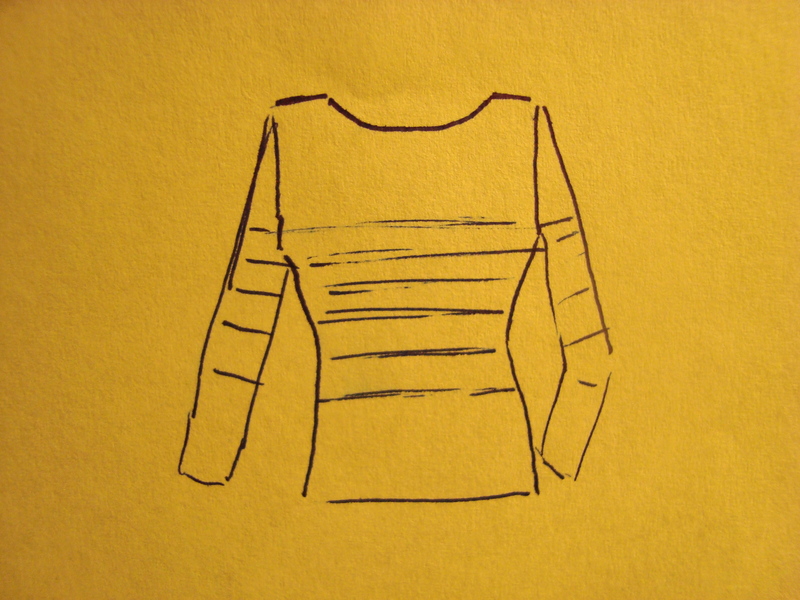 Or, I could use a fitted body with set in sleeves, and do non-standard striping. I love this design. That surprises me, because I don’t think of myself as much of a horizontal stripes person, but I really like the way they’d highlight the shaping, especially if they’re not evenly spaced. 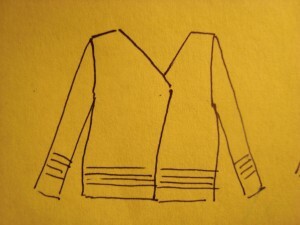 If not now, this is a sweater that I would like to knit someday. But it’s high on the list of contenders for today, too. 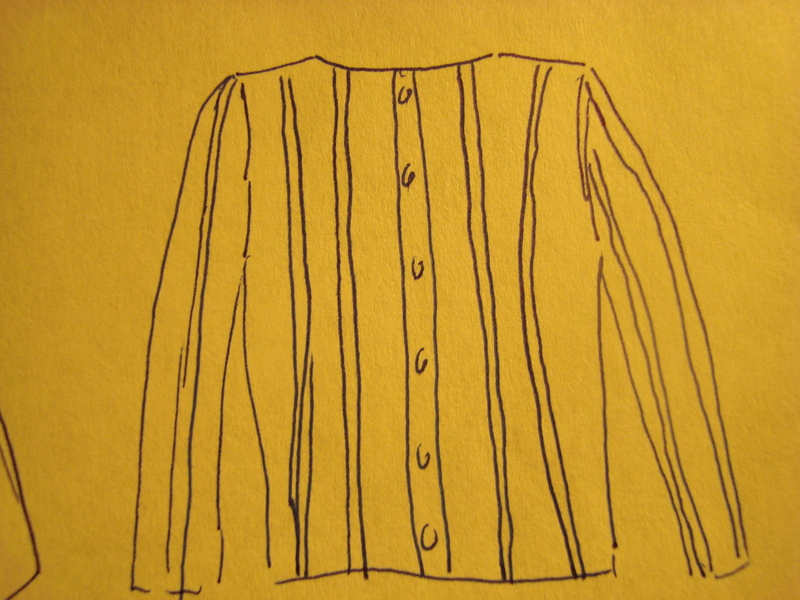 Or, I could do one of those shadow-knits that are knit sideways and give a garter stitch striping effect. 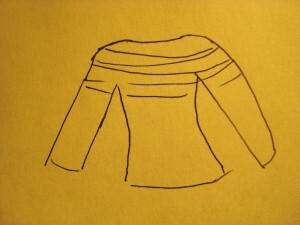 I like the idea in principle, but I’ve seen a few of those sweaters in person and didn’t love the way they hang as they stretch with use. (I’m also not sure I have enough of the accent yarn.) Perhaps a firm enough fabric would be able to hold its own against gravity, but I’m not sure. And I guess that’s all I really need to say about that one. But there was something interesting hiding in there, too. 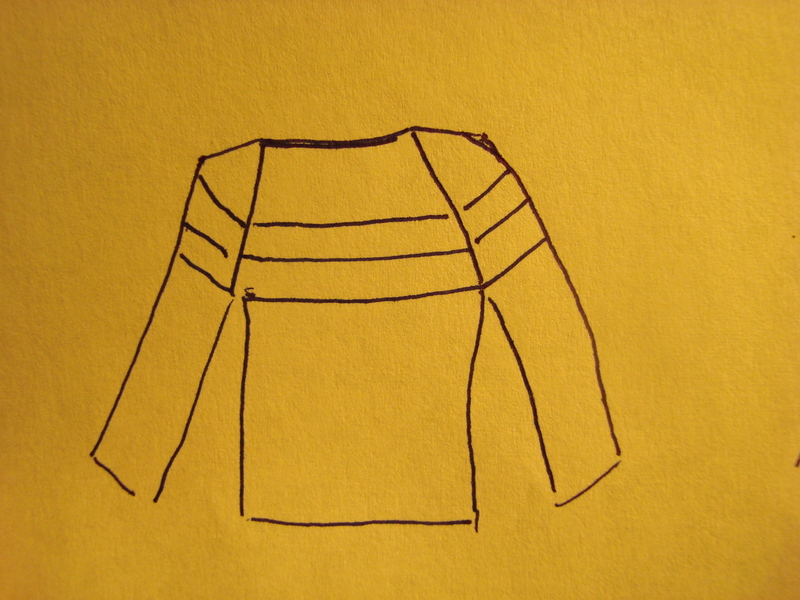 What if I did a little nip and tuck here and there to add some shaping, and changed the neck a bit? 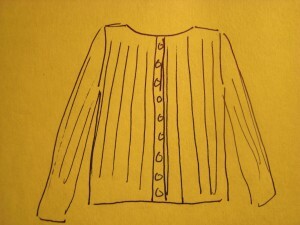 It’s a simple sweater; just a fitted body with set in sleeves. Couldn’t be easier, really. 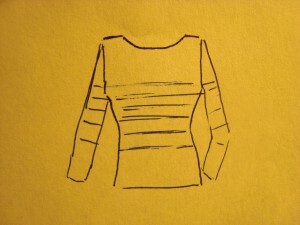 Worked the right way, the stripes will accent the curves, and should stand out front and center in the design. 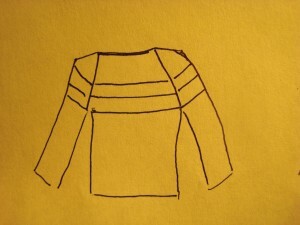 But how to make the stripes? It seemed like intarsia would be the best choice. Just a solid stripe, a few stitches wide. I wasn’t sure what that would do with the color repeat, though. So, I swatched. And I didn’t love it. The repeats are very short (only about an inch), and having several stitches across allows them to mix together more than I wanted. 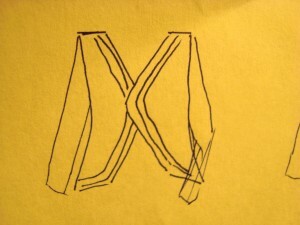 Also, it’s a pain in the neck to make a three-stitch-wide strip lay flat. So, I put it on a black background to hold it in place. Still not in love, but what if I go down to a single stitch? Now that’s more like it. 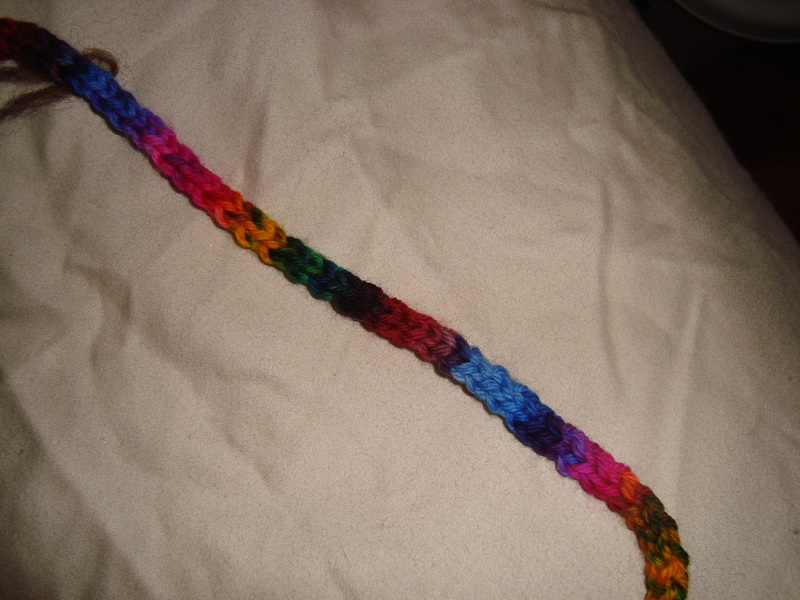 The color segments are now a couple of inches long, and there’s a much more gradual transition from one to the other. Stretching the repeat out like this highlights all the beautiful colors in the yarn, but without letting it devolve into a chaos of colors. The effect is achieved by dyeing two separate warps (the threads that go lengthwise along the fabric), and then shifting them relative to one another so that the color repeats are offset. I found the full color repeat of the yarn (about 3 yards), and laid out 6 strands next to one another. Then I lined them up so that I liked the colors that ended up next to one another. I marked the strands, and began knitting them into a black background. 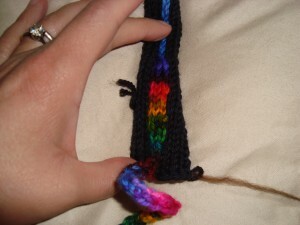 You can see here that I had two different sets of color repeats, in groups of three. 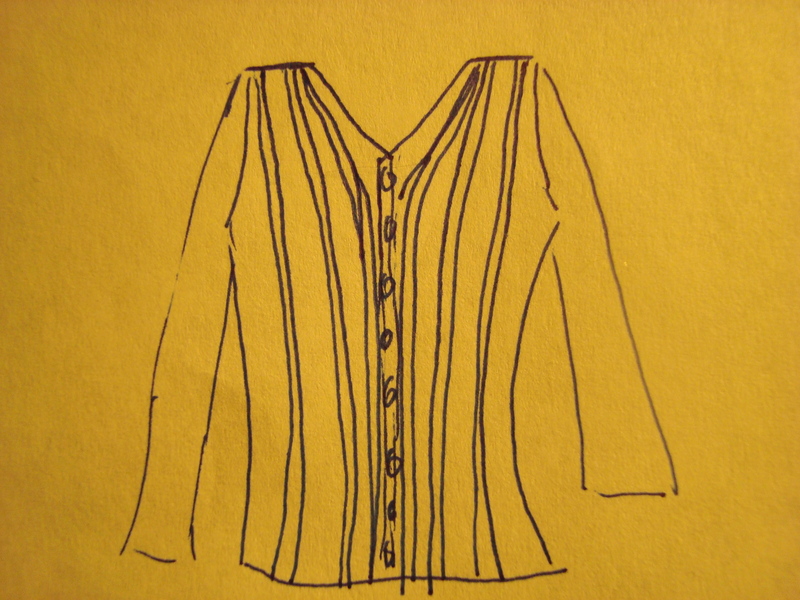 In each group, the two outer stripes change together, and the inner one is on a different repeat. After seeing this swatched up, I think I’d prefer it if all the stripes change at the same time for this yarn. But I can imagine lots of things that you could do with this general idea, especially in more subtly-shifting colors with a foreground and a background that can be offset. 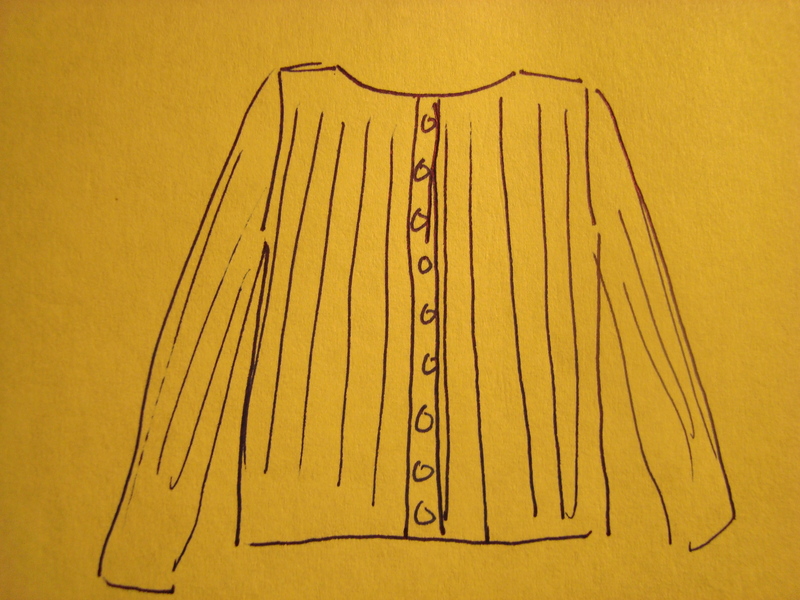 I also played with the spacing of the stripes. I started out with three stitches between them, then reduced to two, then to one. 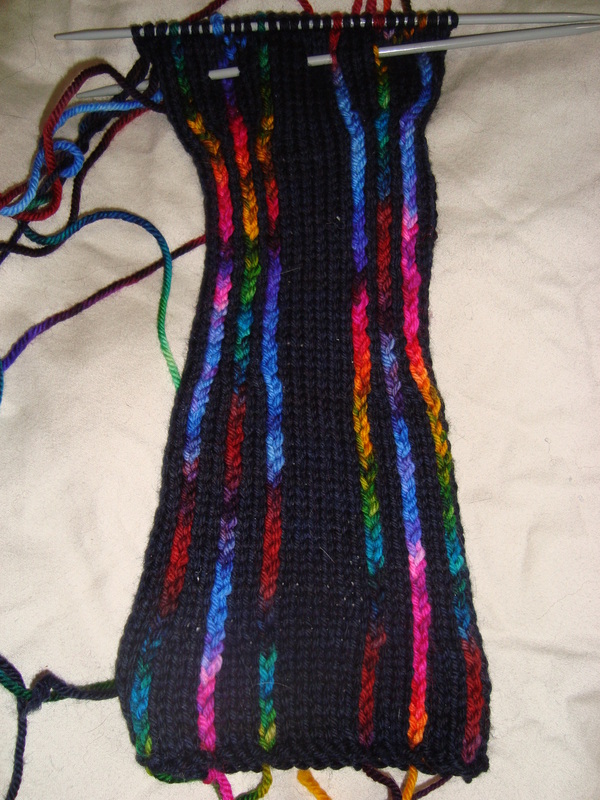 I had intended to do my shaping in the wider black areas between the stripes, but I actually like the way this looks, so I may do some shaping in between, too. 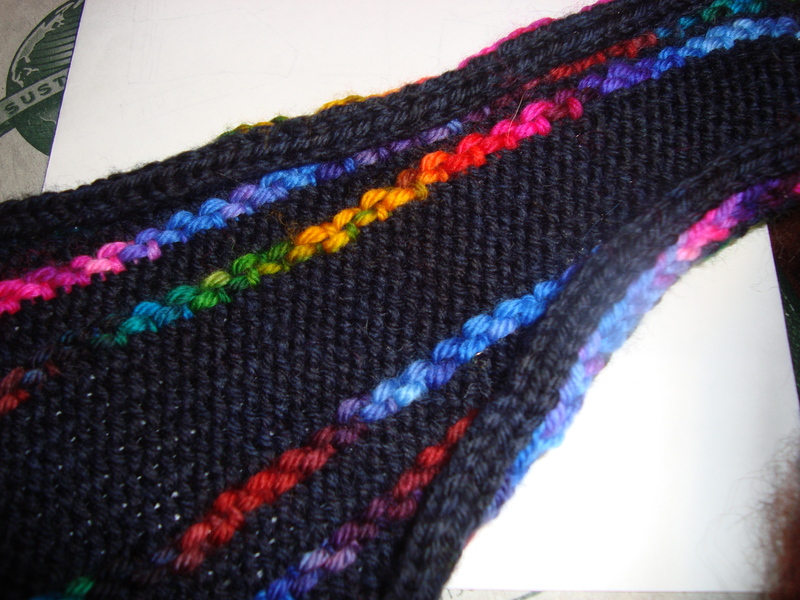 If I do keep the stripe spacing constant, I like the single-stitch spacing the best. 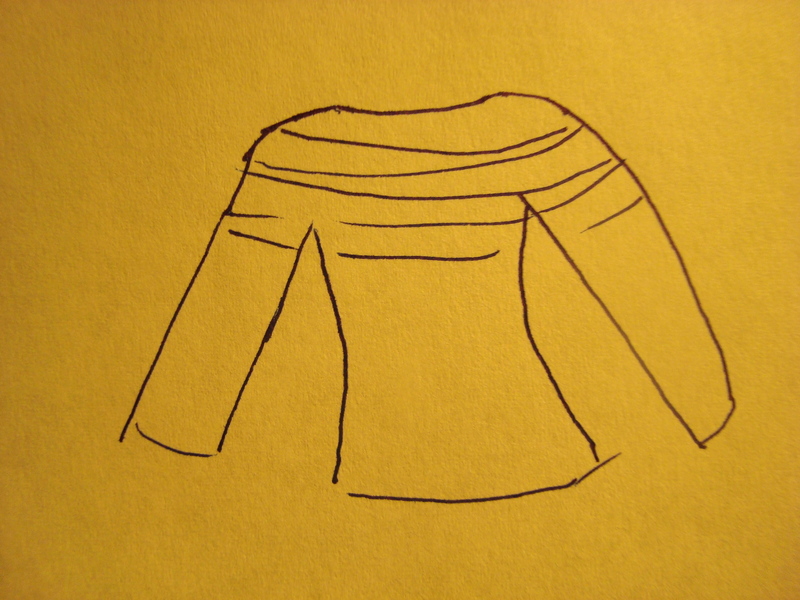 I love the way the reverse side looks, too. So nice and neat. All the intarsia wraps line up, and create “vertical purl stitches” as Branden put it. I think this may be it. I’ve said before that I’m not very good at the artistic arrangement of stripes, so I’ve been doing due diligence on Google image search trying to find a pattern that will work here. I’m not stuck on groups of three, and actually I’m thinking that a more random arrangement will probably work better. 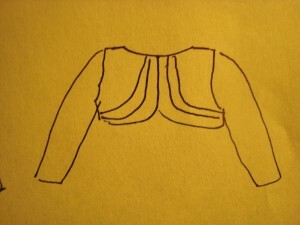 I’ll also need to decide where to put the color repeats in the garment (neon pink on the bust shaping, or at the waist? Don’t want that to end up in the wrong place by mistake…), but I think this could work well. Oh wow, so many ideas. I can’t wait to see what you decide upon. Personally, I wouldn’t be brave enough to try to make something work in a multicolor yarn with such a short repeat. Good luck! I’m intrigued, because I have a collection of odds and ends that I’ve been mentally designing in a similar way without having actually done any of it yet. Yours is beautiful. That is way cool. 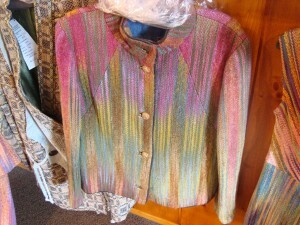 Those colors also made me think about knit one below stitch patterns, but they consume a lot of yarn. I like the idea of using the space dyed yarn so intentionally. For stripe sequences, I always start with Fibonacci, though it sometimes isn’t right. But it is a good place to start! DesigKnit is powered by	WordPress 4.8.9 . Page generated in 0.338 seconds using 51 queries. Theme: Derived from Connections Reloaded v2.1 by Ajay D'Souza. 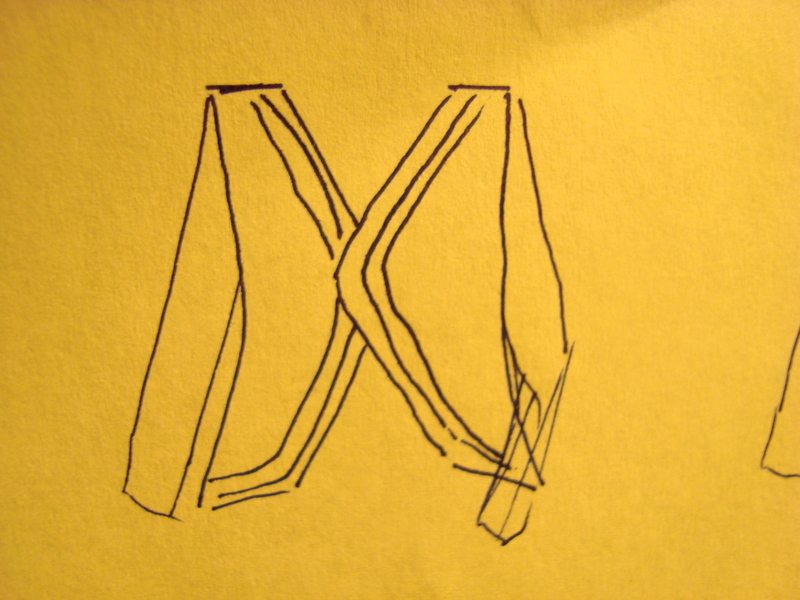 Derived from Connections.